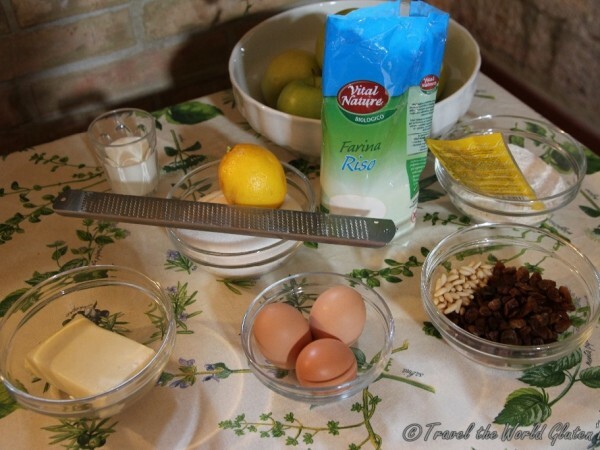 Gluten Free cooking class in Tuscany, Italy at Agriturismo Podere San Lorenzo. 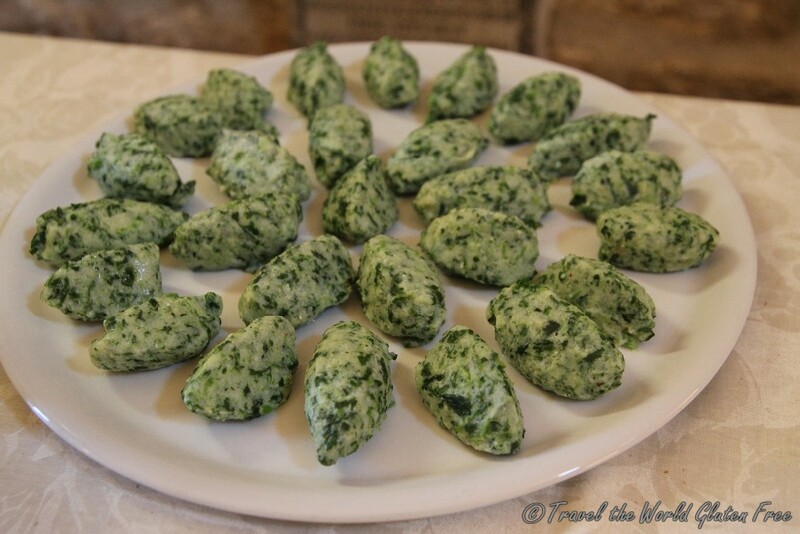 Primi: gnudi (naked ravioli) full of ricotta cheese and spinach. 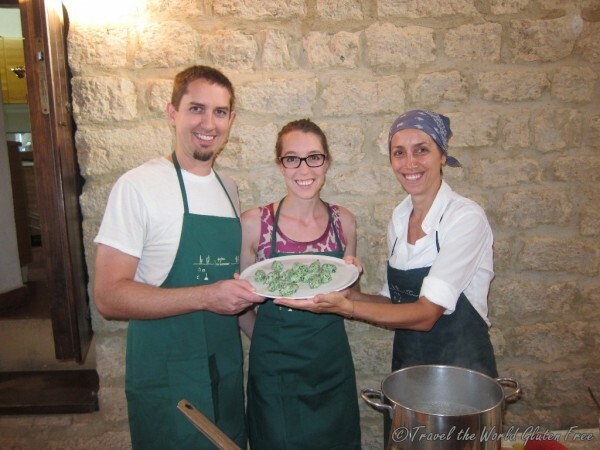 Marianna was nice enough to ask us if we preferred to make two different batches of fresh pasta, one gluten free and one with gluten, or if we preferred to make gnudi for everyone. We thought that gnudi would be much more ‘fun’ and interactive to make, plus it sounded delicious. So gnudi it was. We had to use a lot more rice flour than they normally use with wheat flour in order to get the consistency correct so that the gnudi wouldn’t fall apart while cooking. It was really hands on making gnudi as we used a two spoon technique to form the gnudi and then we’d drop them into boiling water until it floated to the top. 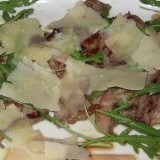 It was served with a butter & sage sauce, which allowed the flavour of the gnudi to shine through. Amazing!! 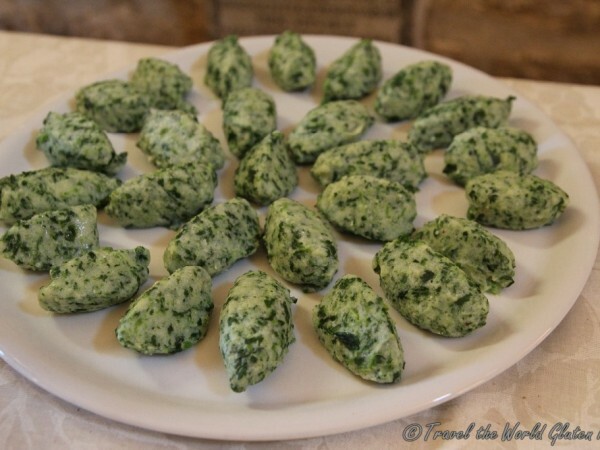 The soft, smooth ricotta cheese was countered with specks of vibrant green spinach, it was magic. Honestly it was so decadent and fancy; I couldn’t believe we actually made it! We need to make it at home. One of three plates of gnudi we made, perfectly shaped if I say so myself! 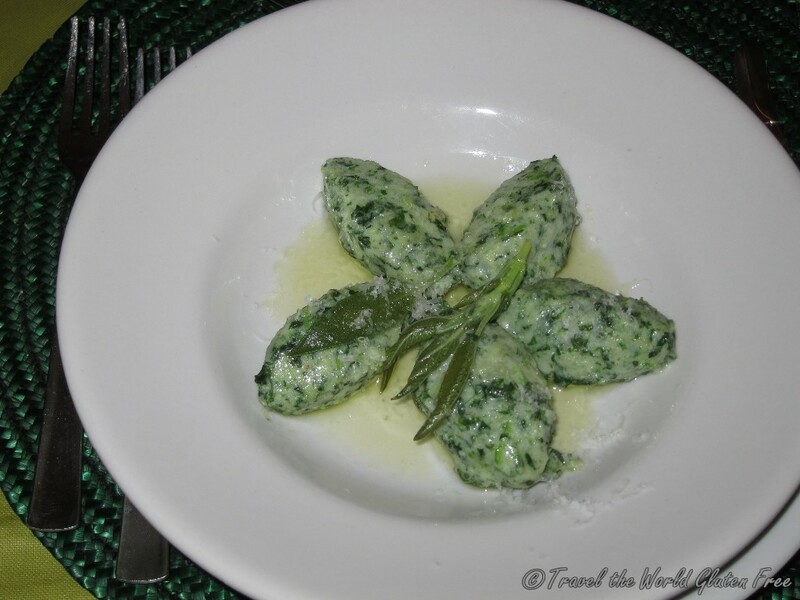 The plated gnudi with the butter and sage sauce… Divine! 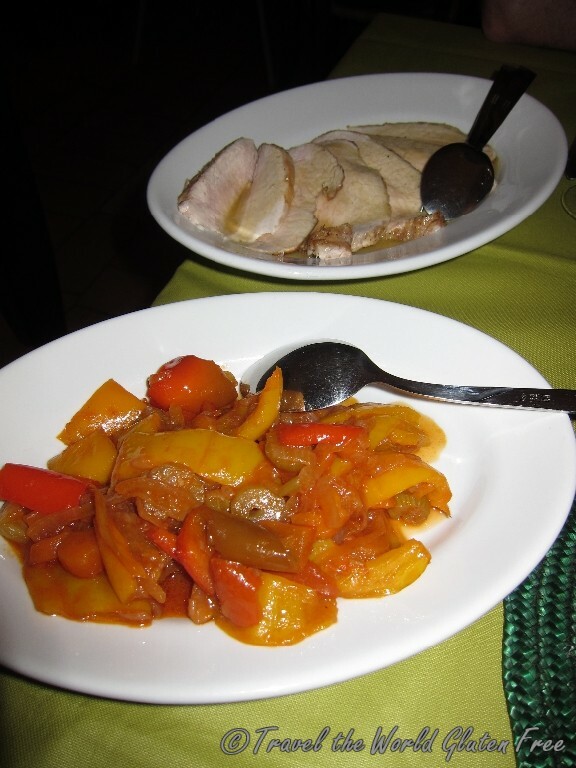 Secondi: Pork roast cooked in white wine with a side dish of peppers. 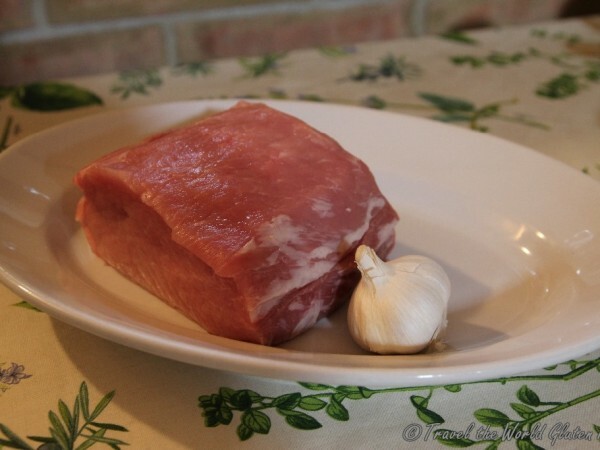 Prior to searing, we cut holes in the pork so that we could push slivers of garlic deep into the pork to add flavour, then we rubbed coarse salt and pepper across the raw pork. 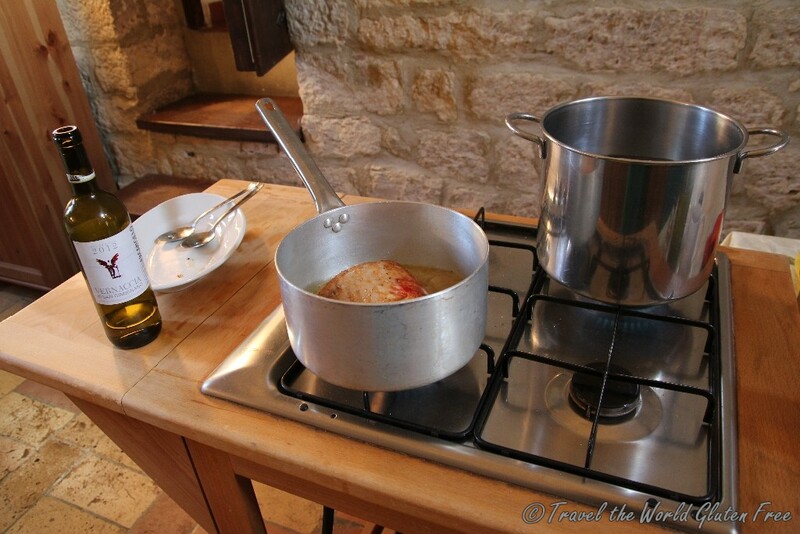 The pork sizzled as the juices were seared in a large pot of boiling white wine. 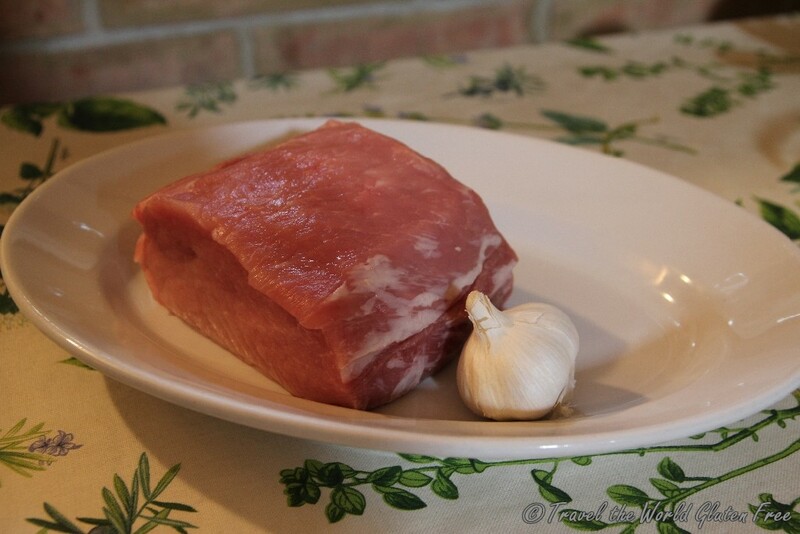 Marianna said that pork stays more moist when cooked on the stove top rather than in the oven. 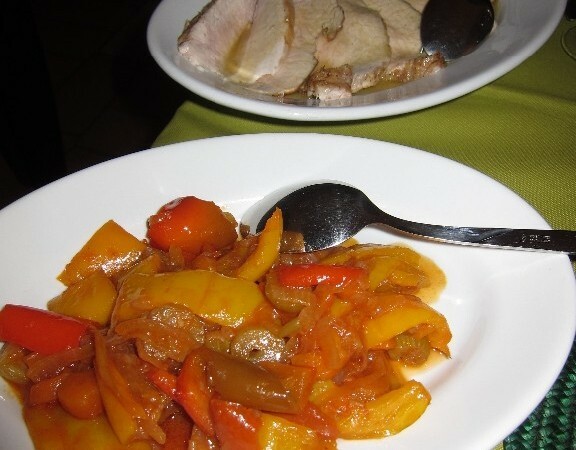 As an accompaniment, we chopped up a lot of vegetables to make peperonata, a pepper, celery, carrot and onion mixture simmered with tomato paste. The flavours were so intense they were amazing. As a bonus, we actually learned how to chop vegetables; I think it’s safe to say I need to get a bigger, better knife to cook with at home. 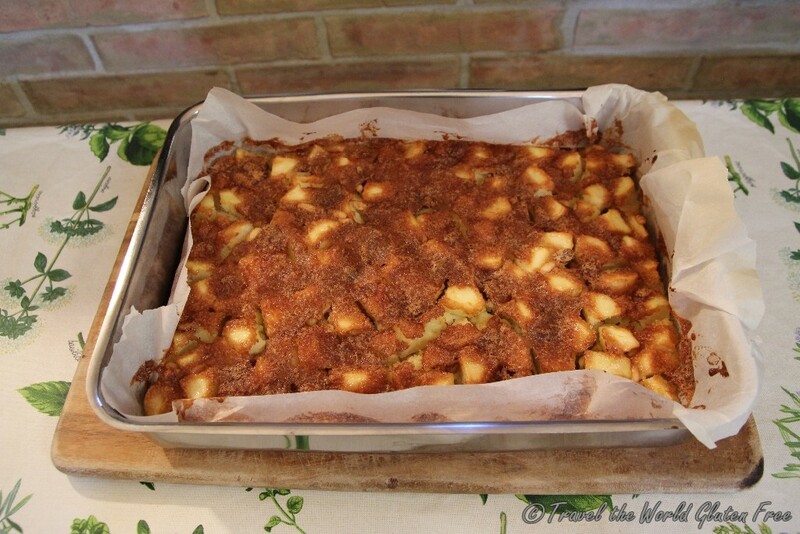 Dolci: torte di mela – apple cake! Not only was it senza glutine, there was no soy or gums in the ingredients. 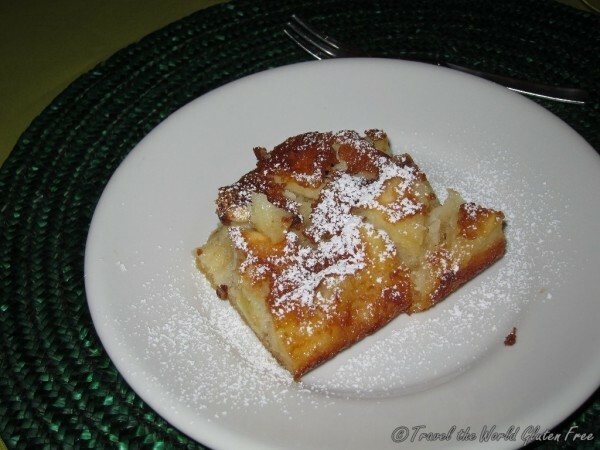 I honestly have been dreaming of this cake ever since. 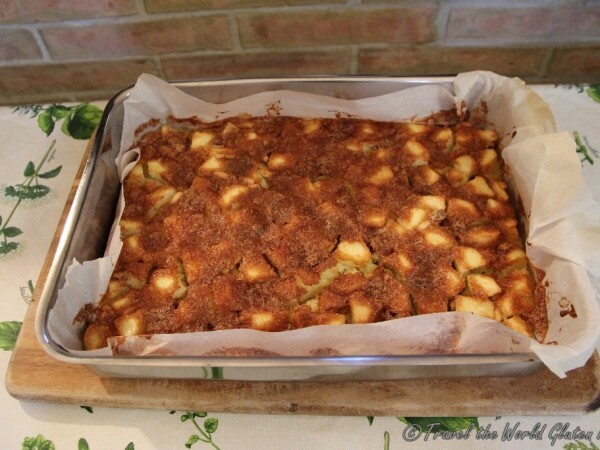 It was incredibly easy to make and required hardly any flour as the large chucks of apple make up the majority of the cake. The top of the cake caramelized so when it came out of the oven, it smelled like caramel apple bliss. When Marianna asked if we wanted to sample it, I didn’t hesitate to say yes! It was delightful and didn’t taste anything like the dry gluten free cakes I’m used to at home. 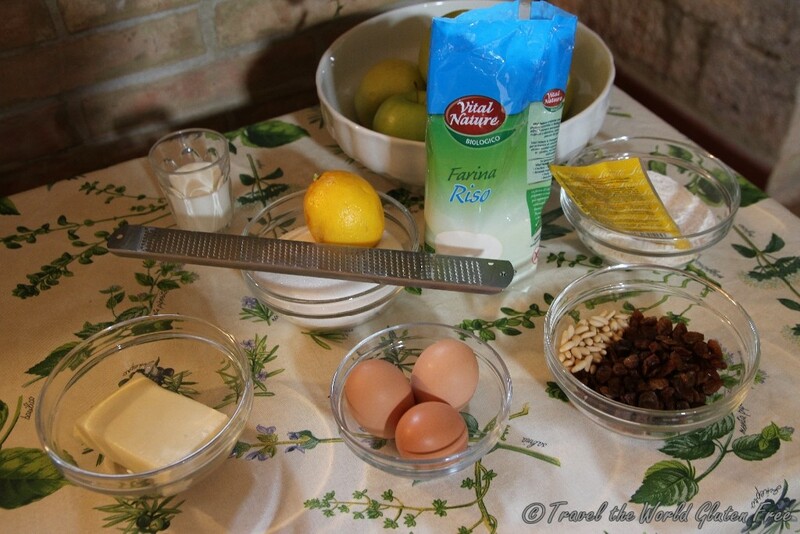 I can’t wait to make this again, if only it was easier to find raw pine nuts. It’s important to cook pasta to al dente. 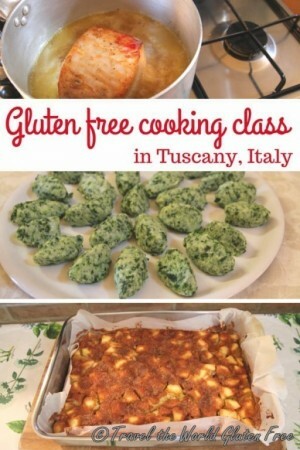 Never overcook it because it becomes soggy, this is especially true for gluten free pasta. There should be a bit of a bite to it. It is always better to toss the cooked pasta in the sauce prior to serving so that it absorbs the flavours more. 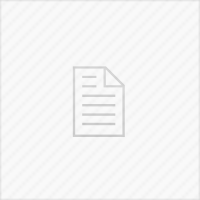 If you are planning to do so, make sure that you cook the pasta two minutes less since it will continue to cook as you heat it with the sauce. It’s shocking that something so simple was like an epiphany for us. All this time we have been cooking our favourite pasta where we mix the pasta in with the olive oil and Dijon mustard sauce, it now makes sense why our noodles would fall apart and get soggy. 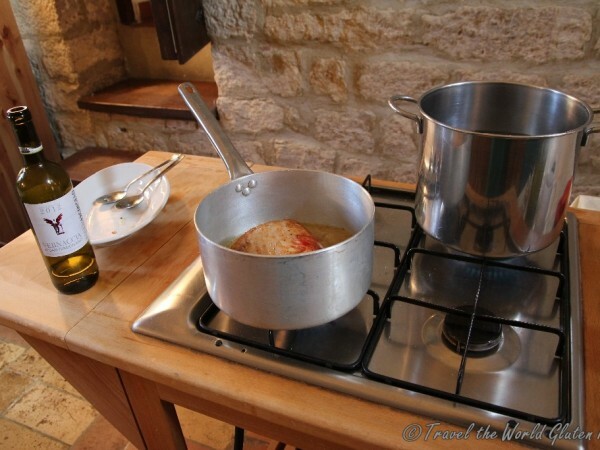 We would overcook it in the pot and then cook it another few minutes as we stirred in the parmesan and sauce. I think I’ve always just been too lazy and preoccupied to actually pay attention to how long I cook my pasta. Now I know better. 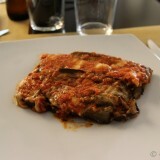 We also asked the all-important question, “how do you make a good tomato sauce?” Marianna said there were a few keys. One being if you use fresh, vine ripened tomatoes make sure to remove the skin and seeds inside. Also, after cooking the sauce it is valuable to blend it in a blender in order to get a better consistency. She said this will help our problem where the sauce doesn’t coat our pasta. What a genius idea! She said we can blend it up with other ingredients too rather than just simply tomato sauce. Onions, garlic and carrots are a must she said. 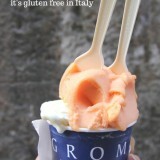 My Favourite Gelato in Italy! It’s Gluten Free.